Making your own home is everyone’s dream. Well, some fulfill it with an apartment, others prefer buying a land and constructing their home their way. The freedom of getting your house constructed as per your requirement and specifications is the biggest advantage of buying a plot in Bangalore India. In an apartment, everything is done and you can only work on the interiors. But, on your plot of land, you can do the interiors and exteriors your way. When buying a land is on your mind, then getting land loans is the first thing that you need to understand. There are various banks and financial institutions, which offer you a loan for plot purchase. So, below is a complete plot loans guide for you, which will come handy in understanding all the intricacies and making your dream home, a reality. Making your own home is everyone’s dream. Well, some fulfill it with an apartment, others prefer buying a land and constructing their home their way. The freedom of getting your house constructed as per your requirement and specifications is the biggest advantage of buying a plot in Bangalore India. In an apartment, everything is done and you can only work on the interiors. But, on your plot of land, you can do the interiors and exteriors your way. When buying a land is on your mind, then getting land loans is the first thing that you need to understand. There are various banks and financial institutions, which offer you a loan for plot purchase. So, below is a complete plot loans guide for you, which will come handy in understanding all the intricacies and making your dream home, a reality. When it comes to applying for a land loan, you should check if the land is located within municipal or corporation limits, otherwise, banks will not sanction a loan against it. Likewise, you can get a loan only on a residential plot, so check this before applying for a loan against plot in Bangalore. For plot loan, the loan to value, i.e. the quantum of loan you can get the property is usually 70 to 75% of the total value. So, you will need to arrange for the remaining 25 to 30% of the property value. Otherwise, if your spouse is working, then you can opt for a co-applicant in your loan application and get more loan for plot purchase. Most banks give loan for 15 to 20 years on a land loan. When you apply for a plot loan in Bangalore India or anywhere in India, you need to check with the bank regarding the tenure option. Banks will mainly offer you a loan for 15 years, while some financial institutions give a 20 year’s loan. Along with loan tenure, the capping on loan amount is also something which you need to consider. While, some banks have a capping of 50 lakhs, some other offer up to 1 crore rupees. So, check with the bank for the maximum loan availability. Another important feature of a plot loan is that you cannot get tax benefit on it. So, to ensure that you get the loan easily and can avail tax benefit on it, apply for a composite loan. It includes plot loan and loan against construction. It will help you meet both the costs and you can reap tax benefits, too. When applying for this loan for buying plot in Devanahalli Bangalore, you will need to tell bank regarding the plot value and estimate construction cost of the dwelling unit. Then, the bank can offer 70 to 90% of the estimated amount. These are some of the important things which you need to know regarding plot loans. The bank, which offers you the best loan option, you can apply there for the loan. Here is a step by step insight into your land loan process. The loan application for new villa projects in Devanahalli Bangalore mainly requires some basic, personal details. You need to provide information including education, income, employment, property details, loan amount needed, and property value among others. 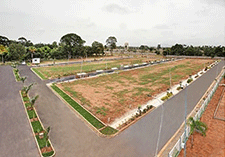 Once you file a loan application for plot loan for Devanahalli, you should get some documents in place. Most banks require you to furnish documents like age, identify, income, address proof. Along with this, you will have to give employment details, bank statement, and details of the property you are finalizing. Thereafter, the bank will initiate a verification process. From your documents to the details shared, everything will be verified. The bank officials will also verify the property for which you are availing the loan. Then, the loan will be disbursed. If you are looking for villa plots in Devanahalli Bangalore for sale, then you can view the many options by Merusri Developers. 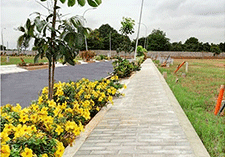 We specialize in Devanahalli real estate and have different plot options. The best part about investing at Merusri is we give you the joys of community and independent living. So, you live in your villa, but enjoy the benefits of a gated community. RERA compliant with BIAAPA & STRRPA approval our projects have approval from all the leading banks. So, getting a loan for plot purchase at a Merusri project will be a breeze. You can view our project online and plan a site visit to make your dream home a reality. Why Opt for Residential Plots with Amenities?